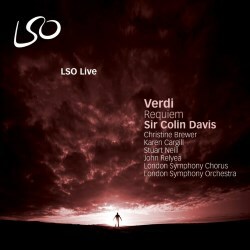 In 2017 I reviewed what was then a new release of the Verdi Requiem on the LSO Live label. That was taken from two concerts in September 2016 conducted by Gianandrea Noseda. Overall, I was disappointed by the performance, as was my colleague, Dan Morgan, who reviewed Noseda’s recording in its download incarnation. I was interested to see that Dan used as his principal comparison the same label’s recording of the work conducted by Sir Colin Davis. That was a version that had passed me by and, moreover, it doesn't have a full review here (though it is covered in Ralph Moore's conspectus) so I decided to invest in a copy. The Davis performance begins auspiciously. He adopts a significantly slower basic tempo for the ‘Requiem’ and ‘Kyrie’ movement than does Noseda: he takes 9:09 compared to Noseda’s 7:41. But the difference is about far more than questions of pacing and timing. Davis seems to feel the music far more intuitively and with far greater understanding than his Italian colleague. The phrasing is infinitely more imaginative and caring and that’s crucial. By comparison, I’m afraid that, to be frank, Noseda sounds prosaic. At ‘Te decet hymnus’ (Cue 2 in the Ricordi vocal score) Davis respects the marking Poco più and moves the music forward a little, whereas Noseda becomes much more urgent at this point, which seems jarring to me. The LSO Chorus sings very well for Noseda but it’s Davis who gets them to sing really quietly in this movement and thereby he establishes a far more potent ambience. Throughout the entire performance it’s Davis who brings out far more through his phrasing. In the ‘Dies irae’ Davis adopts a steadier speed than Noseda but he’s no less exciting and his pacing allows much more telling articulation by choir and orchestra. In my review of the Noseda I expressed disappointment with his treatment of the ‘Tuba mirum’ and, in particular, an unwarranted speeding up when the fanfares are heard on full brass (Cue 14). I pointed out that most conductors, including my chosen comparator, Riccardo Muti, maintain an unchanged tempo at this point. Well, add Sir Colin to that list. His pulse remains steady as a rock and as a result the music has all the implacability for which I’m looking. Later, at ‘Rex tremendae’ Davis is again more measured in his approach and therefore there’s more dread majesty in the music than we experience with Noseda. I’ll just give one more example of pacing. I was disconcerted by Noseda’s breakneck speed for the ‘Libera me’ fugue in the Requiem’s last movement. Rehearing it now hasn’t reconciled me to his way with the music. Davis is suitably fleet but his tempo is much more sane than Noseda’s and I have no doubt which I prefer. In a performance of the Verdi requiem the contributions of the soloists are crucial. Noseda’s soloists are all Italian; in this music, you might think that brings an advantage. Davis has an Anglophone team: an American soprano, a British mezzo, an American tenor and a Canadian bass. I felt that Daniela Barcellona, Noseda’s mezzo, was the pick of his soloists. Comparing her now with Karen Cargill I think that honours are pretty even. I thought that Noseda’s tenor, Francesco Meli was somewhat inconsistent. Stuart Neill, who sings for Davis, is much more even and I greatly enjoyed his performance. In the ‘Ingemisco’ I prefer him overall to Meli, not least for his gentle delivery of ‘Qui Mariam absolvisti’ However, it’s the ‘Hostias’ solo in the Offertorio movement that seals the deal for me. Meli floats the line well but Neill is magically hushed. Noseda’s bass, Michele Pertusi provides a solid foundation to the quartet but I’m still bothered by his over-projected top Bs in ‘Confutatis’. Here, in his anxiety to sing dramatically I think he overdoes things and to my ears the pitching is less than true. That’s a pity as it’s one of the bass soloist’s most telling moments. Elsewhere Pertusi is dependable. I like John Relyea’s contributions to the Davis performance. He’s excellent throughout, whether in solos or as part of the team. In my review of the Noseda performance one of my main reservations concerned the singing of soprano Erika Grimaldi. I’m sorry to report that revisiting the set after a gap of several months has done nothing to ease those concerns. On the contrary, comparison with Christine Brewer has just reinforced my views. I readily acknowledge that Verdi’s tessitura means that the soprano soloist has to work hard. The trouble with Miss Grimaldi is that the listener is all to aware of that: she’s consistently too loud, not just in her solos but also in ensemble work, where she too often dominates. Brewer’s singing is much more controlled. For instance, in the ‘Huic ergo’ section of the ‘Lacrymosa’ she floats the line in a way that Grimaldi simply doesn’t do. Later, the long E flat at ‘Sed signifier’ in the Offertorio, is floated quietly and beautifully by Brewer, the crescendo and sudden drop to ppp both accurately observed. With Grimaldi all we seem to get is an unvaried note which is too loud to start with. Miss Brewer blends with her colleagues very successfully throughout and tops off her performance with a fine contribution to the ‘Libera me’ movement. I admired her performance very much and I think she’s much more stylish and thoughtful than Erika Grimaldi. In both performances the LSO and the LSO Chorus are on top form. However, because Sir Colin is much more alive to nuances in the score I found that in his version I heard considerably more to admire and appreciate in the chorus and orchestral parts. Summing up, I think the decision is very clear cut – and much more so than is often the case when comparing two recordings of the same work. If one is making a choice between the two LSO Live recordings then the Davis set wins hands down in every respect. Davis has a much more satisfactory and better matched quartet who sing as a team. But it’s his skill as an interpreter of this score that wins him the palm. Time and again I found examples where he digs far deeper than Noseda whose approach, I’m sorry to say, appears superficial in comparison. But the excellence of the Davis performance goes beyond a comparison with the Noseda recording. This is a very fine and very satisfying performance in its own right and I’m delighted that I decided to add it to my collection.